Russia is "very sorry" and "ashamed" of cheating athletes who were not caught by its anti-doping systems, the country's sports minister has said. But Vitaly Mutko argued not lifting the ban for the 2016 Rio Olympics would be "unfair and disproportionate" and that clean athletes should not be punished. They will have been rigorously tested by Rio, he wrote in the Sunday Times. Wada's report depicted a culture of systematic state-sponsored cheating by Russia's athletes, with even the secret services involved. "We do not deny having a problem in Russia, and we are doing everything possible at state level to eradicate doping, including punishing athletes and coaches found to have violated anti-doping rules," Mutko wrote. "But doping is a global problem, not just a Russian problem." Mutko said by the time Rio gets under way in August, Russian athletes hoping to compete will have been through a minimum of three anti-doping controls by the sport's world governing body - the IAAF - in addition to in-competition testing. "These are men and women who have sacrificed years of their lives striving to compete at the very highest level, who have dreamed of taking part in the Olympic Games, and who now face having their sacrifice wasted and their dreams shattered," he said. "The reasons for the All-Russian Athletics Federation being suspended from the IAAF have been well documented. "They are weighty. Serious mistakes have been made by the federation management, along with athletes and coaches who have broken anti-doping rules and neglected the principle of fair play, so fundamental to sport, for immediate benefits. "Let us be clear. We are ashamed of them." 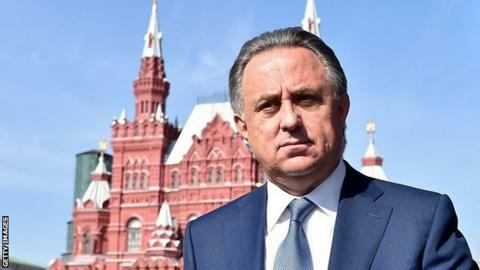 However, Mutko stopped short of admitting the doping scandal was state sponsored. "We are very sorry that athletes who tried to deceive us, and the world, were not caught sooner. We are very sorry because Russia is committed to upholding the highest standards in sport and is opposed to anything that threatens the Olympic values," he said. He added that measures put in place since the ban - including handing over all testing to the UK Anti-Doping Agency until Russia's own programme is restored, changing the leadership of Russian athletics and handing over alleged doping cases to the Court of Arbitration for Sport in Lausanne - mean testing is now "extra transparent". "No other country's athletes will have been placed under the spotlight to the same degree as ours will be," Mutko wrote. "Such an intense glare does not allow anywhere for cheats to hide. "We have done everything that has been asked of us by the IAAF in order to be reinstated. "It would be unjust to demand all these changes and measures, witness them happen, and then still punish Russia's athletes."